There’s an old saying that you can’t teach an old dog new tricks, well that’s probably true in some regards –but I haven’t quite hit that point in my life yet where I can’t still improve upon or become more efficient in things that I do daily. Well, chalk this up to being more efficient. 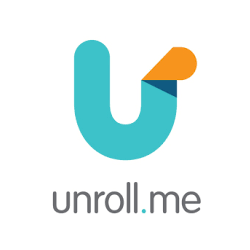 I’ve had friends tell me about unroll.me over the years but I never really bought into the idea until recently. I sat down one afternoon and figured out that my inbox was comprised primarily w/ emails that I wanted to see –but that weren’t what I would consider “important” or “urgent”, but yet they were taking up valuable inbox space next to the messages that were “important” so I pulled up unroll.me to see if this might be a good fit. After using this service I can honestly say that it’s been lifechanging. I get much fewer messages in my inbox these days, and the messages that I want to see are sent right on through –but the messages that are less important are organized into a daily digest email from unroll.me that I can sift through at the end of my day. Talk about awesome! Oh, and probably the coolest feature, unroll me allows me to unsubscribe from mailing lists and newsletters that I’m no longer interested in.